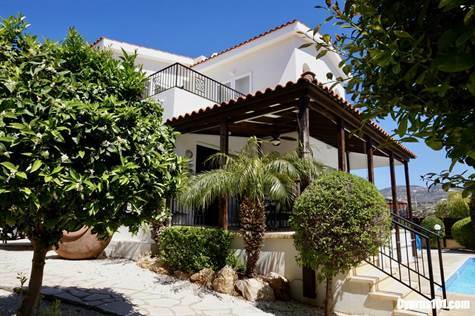 Coral Bay, Paphos – Ideally located for all the amenities of Coral Bay, this delightful 2 bedroom detached villa is situated in a highly sought after residential area, within easy walking distance to the coast and main street of Coral Bay. The property is in excellent condition with good quality modern finishes and many extras including double glazed UPVC windows, air conditioning, ceiling fans, solar panels and much more. The ground floor accommodation features a spacious living room with large archway to a stylish well equipped kitchen with fitted units and central island. Appliances include built-in oven, electric hob, microwave, fridge/freezer and washing machine. Sliding patios doors in both the lounge and dining area provide lots of light and direct access to a large covered terrace overlooking the swimming pool and beautifully landscaped gardens. A hallway accessible from both the entrance and kitchen leads to the guest cloakroom and staircase up to the first floor bedrooms and family size modern shower room. Both bedrooms have fitted wardrobes and UPVC French doors opening on to a large balcony with wonderful views of the surrounding neighbourhood and mountains beyond. The outdoor areas are well designed to enjoy the wonderful outdoor life. The swimming pool and surrounding terrace has plenty of space for sunbathing and relaxing and the mature gardens include an impressive variety of shrubs and trees. The upper veranda with pergola above is an idyllic place to enjoy alfresco dining and soak up the wonderful peaceful ambiance. This property certainly has lots to offer and is suitable as a permanent or semi-permanent home, as well as a holiday home and/or rental investment. Other than a few personal items of furniture, the remainder is included and an inventory can be provided on request. ← Previous Previous post: Chloraka Bungalow For Sale – Price Reduced!